If sleek and stylish is what you seek, then this two-bedroom apartment in Barcelona, located in the Poble Sec neighborhood, awaits you. The area offers guests a more quiet experience than the bustling city center, yet remains to provide easy access to all of the attractions in Barcelona. The apartment is able to accommodate up to five people in total. This chic and modern apartment enjoys a simple yet elegant design. White washed walls alongside the carefully selected black leather furniture, gives this apartment that extra special touch. The living room, furnished with a comfortable double sofa bed, and a TV, offers guests the perfect spot to relax after a day of sightseeing. The French windows that open up onto a balcony allow guests the chance to soak up some Spanish sun, or glance out over this lovely ´barrio´. The fully equipped kitchen has all of the utensils and appliances needed to create your very own home-cooked meal. The apartment has two bedrooms, one furnished with a double bed, while the second has two single beds. There is one bathroom in this apartment, fitted with a bathtub/shower. 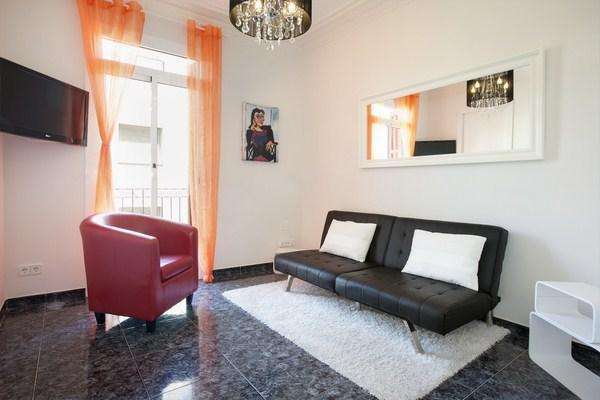 This elegant apartment in Poble Sec, complete with heaters and air-conditioning in the living room is the ideal home-away-from-home, and will ensure that your trip to Barcelona is a comfortable one, any time of the year! Please note: The working hours of the owners of this apartment will be until 18:00h on December 24 and 31. Please arrange to check-in before 18:00h on these days. Check-ins after 20h have an extra charge of 30€ and check-ins after 23h have a charge of 50€. It is possible to pay the refundable damage deposit by debit/credit card when checking-in to this apartment.